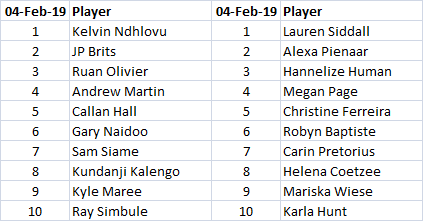 In accordance with the Northerns participation and selection criteria for 2019 the preliminary ladders were compiled from positions at the time of the 2018 Growthpoint Interprovincial tournament and subsequent league results. Clubs are requested to submit further results from internal competitions like club championships and play-offs for league teams to the Northerns administrator at admin@northerns.co.za to be taken into account to finalise the ladder before the 2019 league starts. Blitz league results will also be taken into account but any historical results received after the start of the 2019 league on 27 February will not be considered. Once finalised the ladder will be shown with and without external players. For now the combined ladder is shown. Players are reminded to familiarise themselves with the requirements to represent the province this year.